This is great! I especially love your thumb! 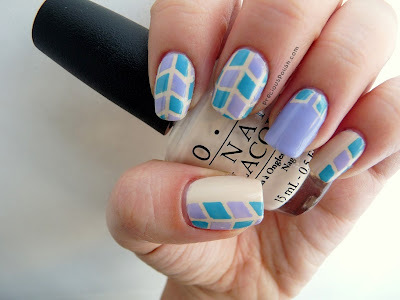 I am loving the OPI Euro Centrale shades, but I agree that a few of them are a bit thin which makes them difficult to use for nail art like this. Regardless, great job with polygon day! Those look fantastic! ^^ Your freehand is so neat... And the colors are so sweet! Though 3 coats is more than I am willing to paint... I almost never go beyond 2.
these are gorgeous! I absolutely love your ring nail it's soooo pretty! Beautiful, the colors are so pretty together! Thanks, Emily! The OPI shades sure are beautiful! Very cute mani! Your thumb is especially beautiful! Ahh you're tempting me to get OPI's You're Such a Budapest...I love the shade! Great design!